Dallas, Texas, 5/13/13 — BLACK DIAMOND™ is a revolutionary new series of crapemyrtles with spectacular black foliage and five brilliant flower colors to choose from. The stunning black foliage emerges in early spring and lasts until leaves drop at the first hard frost. They are all you ever wanted in a Loropetalum, but with better blooms! Planted in full sun, plants hold their stunning dark foliage color over the entire growing season and bloom late-spring through late-fall. Reaching only 10- to 12-feet tall, these semi-dwarfs are perfect for urban landscapes, small spaces and containers. The BLACK DIAMOND™ Crapemyrtles were bred by a USDA research scientist and feature five vivid color selections including ‘Best Red’, ‘Crimson Red’, ‘Red Hot’, ‘Blush’, and ‘Pure White’. In field trials, BLACK DIAMOND™ plants showed an improved resistance to both powdery mildew and leaf spot; fungal diseases that can be a problem for most crapemyrtles. A versatile shrub, it makes a show stopping specimen, anchor plant or blooming row hedge; it can also be grown in containers as a patio or pool plant. Plants can be hand-pruned or sheared to the ground to maintain a 4- to 6-foot blooming row hedge. Watch an informative video from Louisiana State University. 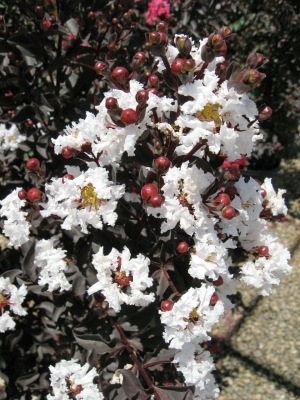 Consumer Sorces: The BLACK DIAMOND™ Crapemyrtles are available for purchase at home improvement stores and garden centers. Consumers can visit Where To Buy to locate closest retail outlet. Consumers can also mail order plants through Sooner Plant Farm and Plant Me Green. Retailers/Wholesalers: Plants are currently grown and distributed by J Berry Nursery (Texas) to home improvement stores and garden centers in: Texas, Oklahoma, Louisiana, Arkansas, Missouri and Kansas and are expanding to additional regions. Simpson Nurseries (Florida), who partners with J. Berry Nursery, ships to Florida, Nashville, Charlotte, Washington D.C., Baltimore, Philadelphia, and Atlanta. If you would like more information about this topic or would like to schedule an interview, please contact Leslie Halleck directly via EMAIL . You may download a complete PDF of this press release below, which contains additional contact information.